Greater Manchester Fire and Rescue Service (GMFRS) said it has scaled back in the last week from three fires in Tameside, Bolton and Denshaw and has now withdrawn all firefighters. The blaze broke out on 24 June and about 100 soldiers were drafted in to help tackle it at its height. 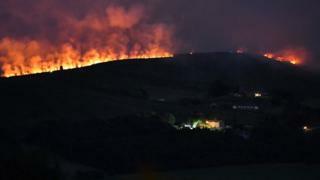 The GMFRS said it has monitored all of the areas on the moorlands around Saddleworth to ensure the fires are fully out. Equipment is being removed from the area and recovery work with partners will begin, it added. Interim chief fire officer Dawn Docx said: "The last three weeks has been one of the busiest periods that GMFRS has ever experienced and I am incredibly proud of all of our crews, officers and support staff that have worked extremely hard to fight the fires and keep local communities safe. She added: "The much needed rainfall over the moors has meant that we have now been able to close the incident but I must remind everyone to stay safe on the moorlands especially as schools are due to close this week." Greater Manchester Police (GMP) is treating the fire as arson. It said people were seen lighting a bonfire on the moors near Stalybridge on 24 June, shortly before a call was made to the fire service. Follow BBC North West on Facebook or on Twitter. And we would love to hear your story ideas - please email northwest.newsonline@bbc.co.uk.